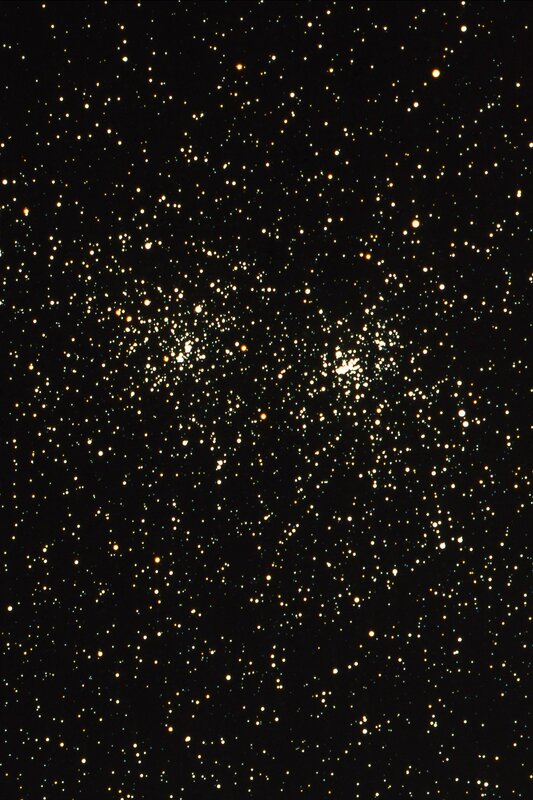 The Double Cluster in Perseus, h and Chi Persei (Chi on the left), are young clusters of stars only about 13 million years old that are moving through space together. At a distance of 7650 light years (accurate to 2%), and dimmed by 1.8 magnitudes by absorption of starlight by interstellar dust, they are just barely visible to the naked eye to the east of the "W" of Cassiopeia. The clusters represent one of the few cases where Greek letter names were applied to astronomical objects other than specific stars. Chi Persei is the cluster to the right. When Bayer ran out of Greek letters, he used Roman letters; which are only rarely now used. Photo by Mark Killion.